Azure Application Gateway supports end-to-end encryption of traffic. Application Gateway terminates the SSL connection at the application gateway. The gateway then applies the routing rules to the traffic, re-encrypts the packet, and forwards the packet to the appropriate back-end server based on the routing rules defined. Any response from the web server goes through the same process back to the end user. Application Gateway supports defining custom SSL options. It also supports disabling the following protocol versions: TLSv1.0, TLSv1.1, and TLSv1.2, as well defining which cipher suites to use and the order of preference. To learn more about configurable SSL options, see the SSL policy overview. SSL 2.0 and SSL 3.0 are disabled by default and cannot be enabled. They are considered unsecure and cannot be used with Application Gateway. In this scenario, you learn how to create an application gateway by using end-to-end SSL with PowerShell. Create a resource group named appgw-rg. Create a virtual network named appgwvnet with an address space of 10.0.0.0/16. Create two subnets called appgwsubnet and appsubnet. Create a small application gateway supporting end-to-end SSL encryption that limits SSL protocol versions and cipher suites. To configure end-to-end SSL with an application gateway, a certificate is required for the gateway and certificates are required for the back-end servers. The gateway certificate is used to derive a symmetric key as per SSL protocol specification. The symmetric key is then used encrypt and decrypt the traffic sent to the gateway. The gateway certificate needs to be in Personal Information Exchange (PFX) format. This file format allows you to export the private key that is required by the application gateway to perform the encryption and decryption of traffic. For end-to-end SSL encryption, the back end must be whitelisted with the application gateway. Upload the public certificate of the back-end servers to the application gateway. Adding the certificate ensures that the application gateway only communicates with known back-end instances. This further secures the end-to-end communication. The configuration process is described in the following sections. This section walks you through creating a resource group that contains the application gateway. Sign in to your Azure account. Select the subscription to use for this scenario. The following example creates a virtual network and two subnets. One subnet is used to hold the application gateway. The other subnet is used for the back ends that host the web application. Assign an address range for the subnet to be used for the application gateway. Subnets configured for an application gateway should be properly sized. An application gateway can be configured for up to 10 instances. Each instance takes one IP address from the subnet. Too small of a subnet can adversely affect scaling out an application gateway. Assign an address range to be used for the back-end address pool. Create a virtual network with the subnets defined in the preceding steps. Retrieve the virtual network resource and subnet resources to be used in the steps that follow. Create a public IP resource to be used for the application gateway. This public IP address is used in one of the steps that follow. Application Gateway does not support the use of a public IP address created with a defined domain label. Only a public IP address with a dynamically created domain label is supported. If you require a friendly DNS name for the application gateway, we recommend you use a CNAME record as an alias. All configuration items are set before creating the application gateway. The following steps create the configuration items that are needed for an application gateway resource. Create an application gateway IP configuration. This setting configures which of the subnets the application gateway uses. When application gateway starts, it picks up an IP address from the configured subnet and routes network traffic to the IP addresses in the back-end IP pool. Keep in mind that each instance takes one IP address. Create a front-end IP configuration. This setting maps a private or public IP address to the front end of the application gateway. The following step associates the public IP address in the preceding step with the front-end IP configuration. Configure the back-end IP address pool with the IP addresses of the back-end web servers. These IP addresses are the IP addresses that receive the network traffic that comes from the front-end IP endpoint. Replace the IP addresses in the sample with your own application IP address endpoints. A fully qualified domain name (FQDN) is also a valid value to use in place of an IP address for the back-end servers. You enable it by using the -BackendFqdns switch. Configure the front-end IP port for the public IP endpoint. This port is the port that end users connect to. Configure the certificate for the application gateway. This certificate is used to decrypt and reencrypt the traffic on the application gateway. This sample configures the certificate used for the SSL connection. The certificate needs to be in .pfx format, and the password must be 4 to 12 characters. Create the HTTP listener for the application gateway. Assign the front-end IP configuration, port, and SSL certificate to use. Upload the certificate to be used on the SSL-enabled back-end pool resources. The default probe gets the public key from the default SSL binding on the back-end's IP address and compares the public key value it receives to the public key value you provide here. If you are using host headers and Server Name Indication (SNI) on the back end, the retrieved public key might not be the intended site to which traffic flows. If you're in doubt, visit https://127.0.0.1/ on the back-end servers to confirm which certificate is used for the default SSL binding. Use the public key from that request in this section. If you are using host-headers and SNI on HTTPS bindings and you do not receive a response and certificate from a manual browser request to https://127.0.0.1/ on the back-end servers, you must set up a default SSL binding on the them. If you do not do so, probes fail and the back end is not whitelisted. The certificate provided in this step should be the public key of the .pfx certificate present on the back end. Export the certificate (not the root certificate) installed on the back-end server in Claim, Evidence, and Reasoning (CER) format and use it in this step. This step whitelists the back end with the application gateway. Configure the HTTP settings for the application gateway back end. Assign the certificate uploaded in the preceding step to the HTTP settings. $poolSetting01 = New-AzApplicationGatewayBackendHttpSettings -Name “setting01” -Port 443 -Protocol Https -CookieBasedAffinity Disabled -TrustedRootCertificate $trustedRootCert01 -HostName "test1"
Create a load-balancer routing rule that configures the load balancer behavior. In this example, a basic round-robin rule is created. Configure the instance size of the application gateway. The available sizes are Standard_Small, Standard_Medium, and Standard_Large. For capacity, the available values are 1 through 10. An instance count of 1 can be chosen for testing purposes. It is important to know that any instance count under two instances is not covered by the SLA and is therefore not recommended. Small gateways are to be used for dev test and not for production purposes. Configure the SSL policy to be used on the application gateway. Application Gateway supports the ability to set a minimum version for SSL protocol versions. The following example sets the minimum protocol version to TLSv1_2 and enables TLS_ECDHE_ECDSA_WITH_AES_128_GCM_SHA256, TLS_ECDHE_ECDSA_WITH_AES_256_GCM_SHA384, and TLS_RSA_WITH_AES_128_GCM_SHA256 only. Using all the preceding steps, create the application gateway. The creation of the gateway is a process that takes a long time to run. The preceding steps took you through creating an application with end-to-end SSL and disabling certain SSL protocol versions. The following example disables certain SSL policies on an existing application gateway. Retrieve the application gateway to update. Define an SSL policy. In the following example, TLSv1.0 and TLSv1.1 are disabled and the cipher suites TLS_ECDHE_ECDSA_WITH_AES_128_GCM_SHA256, TLS_ECDHE_ECDSA_WITH_AES_256_GCM_SHA384, and TLS_RSA_WITH_AES_128_GCM_SHA256 are the only ones allowed. Finally, update the gateway. This last step is a long-running task. When it is done, end-to-end SSL is configured on the application gateway. After the gateway is created, the next step is to configure the front end for communication. Application Gateway requires a dynamically assigned DNS name when using a public IP, which is not friendly. To ensure end users can hit the application gateway, you can use a CNAME record to point to the public endpoint of the application gateway. For more information, see Configuring a custom domain name for in Azure. To configure an alias, retrieve details of the application gateway and its associated IP/DNS name by using the PublicIPAddress element attached to the application gateway. Use the application gateway's DNS name to create a CNAME record that points the two web applications to this DNS name. We don't recommend the use of A-records, because the VIP can change on restart of the application gateway. 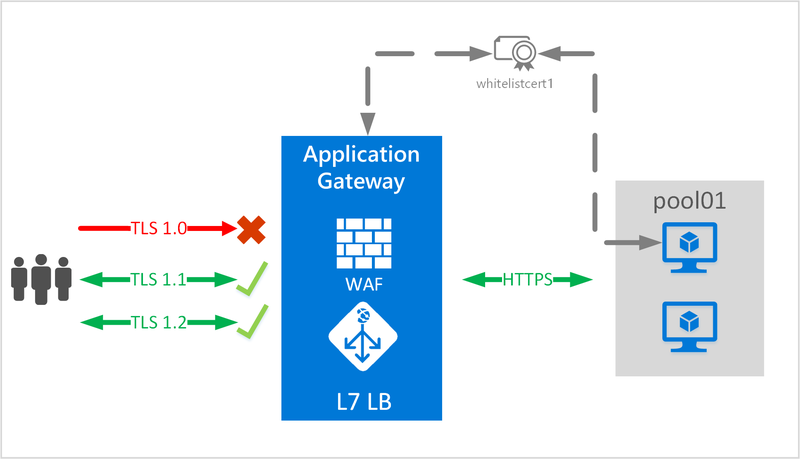 For more information about hardening the security of your web applications with Web Application Firewall through Application Gateway, see the Web application firewall overview.